Last month, I received a really great email from POM Wonderful. I am a big fan of POM juice (especially the blueberry pom option). And the email was highly complimentary of my blog. Thank you! They sent me several samples of their new product POMx Iced Coffee. They didn't ask me to write a review or to concoct something for them either. We had friends over last week and in my ongoing pursuit to try new and amazing cocktails..I created a recipe they raved about (thank you friends). I call it the POM-oh-come-to-Mama-tini . If you like caffeine, which many of you do, this might become your cocktail du jour and it would be happy to replace the red bull and vodka combo which by the way, looks like UA sample. 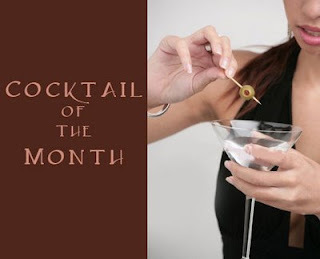 Take your martini glass and draw a circle just below the inside rim with chocolate syrup. Shake it like a poloroid picture. Make them again next weekend and I will join you. Let's have a cocktail? Indeed. Stir. Add fresh lime wedge. Oh my goodness. May I post that for my martini club? Come to Mama indeed....this sounds FAB-U-LOUS!!! I am so thankful for you Ms JennyMac. "Shake it like a polaroid picture....".....love it! haha..Miss Nobody! The bottom recipe IS a mocktail. are you sureyou don't drink? LOL. Sounds delicious! Send one to Charleston? I cant wait to try this myself! I am SO in for next weekend. Why can't it be today?? The raspberry limeade sounds quite refreshing! Thanks for sharing. I love martini's. Yummy! But I am a cheap date...1/2 of a martini and I am napping under the table! You are quite the mixer of concoctions. I wish I knew you 20 years ago! Gonna give the rasberry limade a whirl! Both of these look FABULOUS! I can't wait to try them. "Shake it like a poloroid picture" JennyMac you've been listening to Outcast again haven't you? The POM martini sounds yummy. OMG, I LOVE POM! i can't wait to try their new stuff! love your blog! Mmm that raspberry limeade looks YUMMY! Ooooo, sounds really good, you creative girl, you! Caffeine and liquor - what a deadly combination for me! But I LOVE to live on the edge...CHEERS~! what a great way to start the day. I kid. really. Oh, that sound wonderful...I havent seen the Pomx iced coffee, but now I will be looking and then I will make that drink! Okay, your cafe-choco-tini sounds fabulous. I will try it and let you know how it turns out, if I don't get drunk and forget. Very cool. Will make it a point to try this one next time I'm out on the town. I am forwarding the recipe to Mr. Harried Mom for him to make for me :) he's our mix-master here. Always looking for a new cocktail! ohhhhh myyyyyy. Thanks for the ideas...usually my idea of a martini at home is vitamin water and vodka. Totes mcgotes trying this. You rock. I think it's time to bring back cocktail hour in our household. Ah ha. That sounds so yummy! Ooh, they both look great. I love Pom juice, too, though I haven't tried the blueberry one yet. That raspberry limeade is definitely calling my name. It looks so refreshing! Alcohol is a vice? Does that include wine and beer? I have a little "award" for you. Please do drop by and pick it up. Are there really people that don't drink AND have a computer? Come on . . . I am all over your new Pom concoction. Thank you for sharing the love! JennMac's POM-oh-come-to-Mama-tini sounds awesome! Can't wait to try it...I'll have to keep my eyes open for the POMx Iced Coffees..yum!